This blog post is an excerpt from a larger article on Custom Cooling Solutions published in the August 2011 issue of Process Heating Magazine – click here to see the entire article. A job recently completed for an optics company required an air cooled chiller specially designed to work with a reverse osmosis (RO) water optics process. The optics company contacted General Air Products, described the need for elaborate customization of the internal piping and components of the air-cooled chiller to ensure the integrity of the RO water, and asked for pricing. Changing the internal components was both costly and unnecessary, the chiller manufacturer explained. 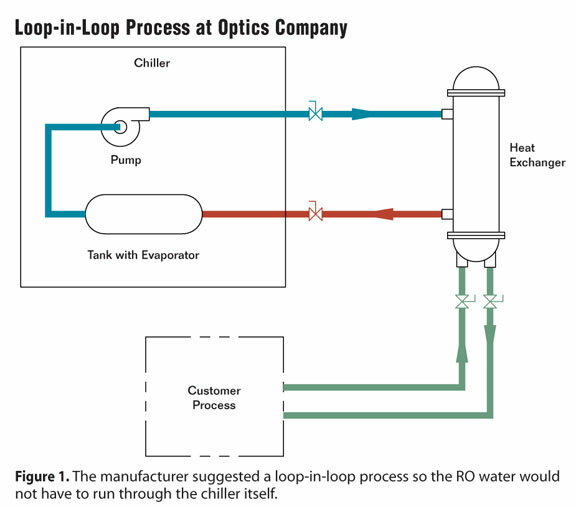 Instead, our process cooling engineers suggested a loop-in-loop process so the RO water would not have to run through the chiller itself (click here to view flow diagram). The loop-in-loop process would utilize an off-the-shelf, 5 ton air cooled chiller with a small amount of specialized piping for the process side, and a shell-and-tube heat exchanger mounted to the chiller frame to maintain the RO water process. By adding a few standard components, the out-of-the-box approach to the process allowed for a significant cost savings for the optics manufacturer. Keep in mind that a loop in loop design is not limited to RO water applications. This process design is used regularly on deionized water (DI) applications, food-grade applications and with all sorts of corrosive chemical and hazardous material cooling. Loop in loop designs also are used in more commonplace applications where large temperature drops are required. In these cases, the heat exchanger is used to add a large amount of surface area, allowing the chiller to handle large-differential process temperatures. This saves the customer from having to buy an expensive chiller and tank system. Click here to view another application where we used a loop-in-loop design to save our customer from the huge expense of customizing the inside of an air cooled chiller with non ferrous piping!